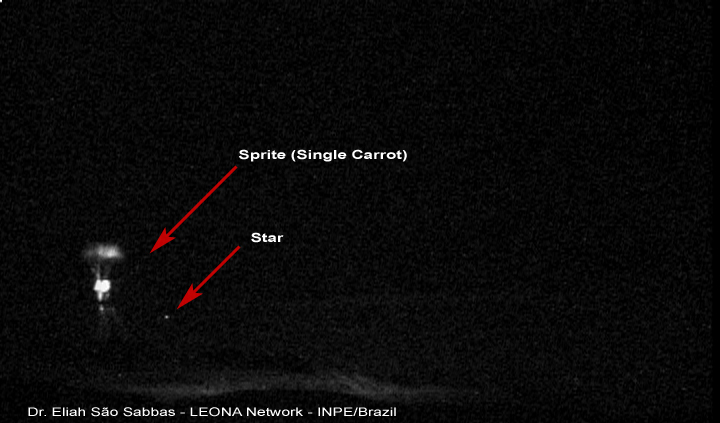 We recorded the image around 23:10 h with the LEONA station installed at CRILAR in Anillaco, Argentina, last Friday (30 November 2018) night. The thunderstorm, apparently a MCS, was over La Rioja province. We were at the INTA site in Chamical finishing up installing the last LEONA station there (3 out of 3 in Argentina) and at the same time started recording remotely both from LEONA station at CRILAR Anillaco and at INTA Las Marias. The storm moved into Chamical, with lots of rain, lightning and strong winds, and cut out the light there. We left back to our hotel about the same time the LEONA system recorded the events. We have been here in Anillaco now since Sunday (2 December), doing final adjustments to LEONA station here, and are leaving to Santiago del Estero tonight 4 December (~500 km trip) to do the same with the LEONA Las Marias station. - 2 possible new phenomena with spherical shape (also need detailed analysis and lightning to tell). I am extremely happy that this 10 year project, LEONA, is starting to be fruitful and within the project RELAMPAGO, of which I am a participant, also together with CACTI project, which has teamed up with RELAMPAGO! So far we could not find TLEs in the Las Marias recordings, to be able to do triangulation, but it is not straightforward to review videos with remote connection, in the next few days we will be there and therefore able to tell for sure. I hope to catch some more amazing events before the end of the campaign, Dec. 18th, and many more after that, since these LEONA stations will be permanently installed here.